Hey everybody here's your Infinity: Battlescape weekly update! I'm thrilled to report that the coding effort for pledge upgrades via credit cards and bitcoin is now complete! I still have to work with our lawyer to get a Terms of Service written before I can release it but hopefully that'll be sometime this week. While waiting for the legal review I'll be shifting over to some low level engine improvements which lay the groundwork for our new UI system for the game. Flavien continues his work on networking. Unfortunately when it comes to planets nothing is easy and it's taking a bit longer than anticipated due to some hiccups with server side hit detection on planet surfaces. Most notably the server needs to generate terrain collision meshes on-demand for every player and particle in the game that happens to be near the ground which, worst case, can be quite a lot over an incredible surface area. This poses some unique technical challenges. 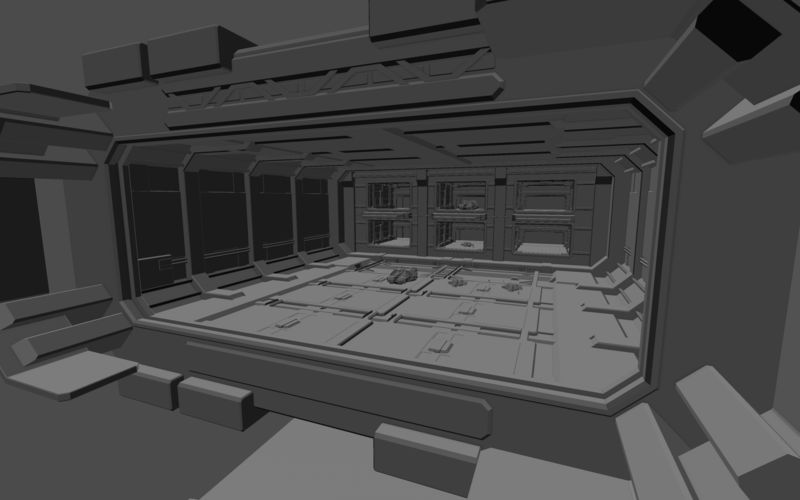 On the art side we're finishing up the large scale final geometry pass for space stations. Once that's complete we'll begin the final geometry pass for factories. Jan and Kristian are still working on the final geometry passes for the corvette and interceptor exteriors. 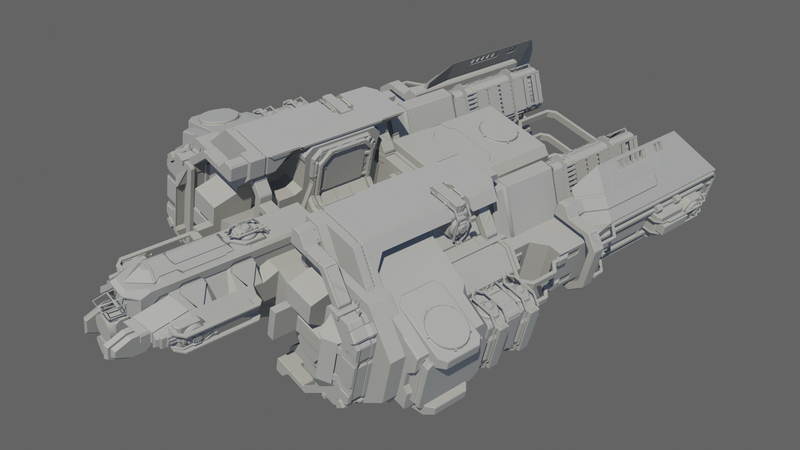 Those are really coming together nicely and they're going to look great once the texturing pass is complete. Lastly if you have an opinion on whether or not our interceptor should have a horizontal bar in the cockpit please head over to our forums and vote. Looking Really Good! I haven't played any Alpha, is the docking for the hangers all automatic, or semi-manual? But seriously, glad you finished the pledge upgrade system while still retaining (most of?) your sanity. Oh, talking of the corvette, where's the rear dorsal (and presumably ventral) thruster now the old one's been replaced with an additional turret mounting point? down a little in that space between the two engines behind it? Usually I don't bother reading TOS but maybe I might make an exception for this project. That is the mark of how excited I am by this! I'm prepared to read legal twaddle! The Alpha isn't out yet, it's been delayed until early 2017. At the moment hangars are all manual but we've discussed the possibility of making some of it automated. Will the ships have landing struts? Yes they will - eventually. Is there some micro gravity within hangars or some magnetic thing to pull ships to the surface once they get within a couple of feet? Some kind of clamp or claw maybe? How far does a gravity generator's field extend? I assume that ships and stations have internal gravity, so it could kick in long before you get to the hangar. It could be a field that drops off by the square of the distance, meaning that as you approach a station, you have to acknowledge it as a kind of building in space, with 1g acceleration all around it, fading to 0g acceleration at some distance. So if you fly up under the station, you're actually having to fly under a building, pushing up with your thrusters instead of just floating there underneath it. If you fly over it and turn off your engines, you'll drop and crash into it. As applied to a hangar approach, you would land as if the station was a building on a planet. You could also land on any 'top' surface of the station. A hollow cylindrical station could be designed such that gravity is forcing objects out away from the center axis of the station. If you fly right down the center, you're in zero gravity, but as you move off that line, you'd start to get pulled onto the inner surface. Or do it the other way and have a solid cylindrical station and have all the gravity pulling towards the center axis of the station. Land on the outer surface of the cylinder. 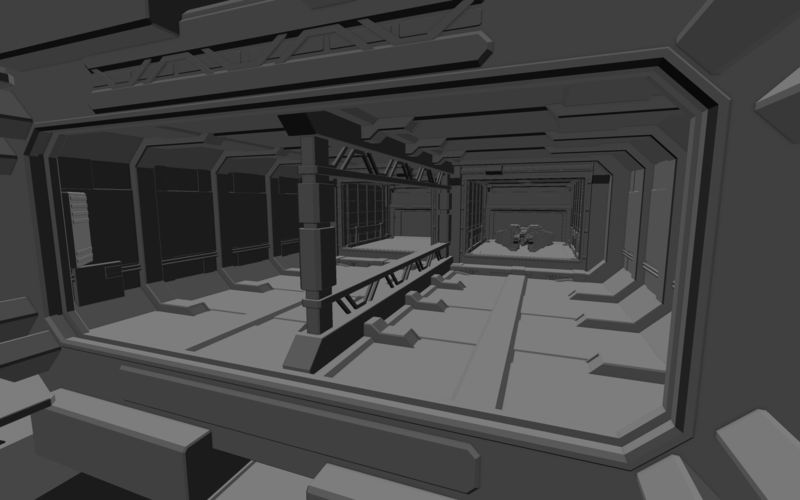 Currently there's no gravity in the hangars but we're planning on adding it at some point. For capital ships they will dock with a set of powered arms that grab them.